Copernicus is one of the largest lunar impact craters on the visible hemisphere of the Moon. It was named after the Polish astronomer Nicolaus Copernicus. 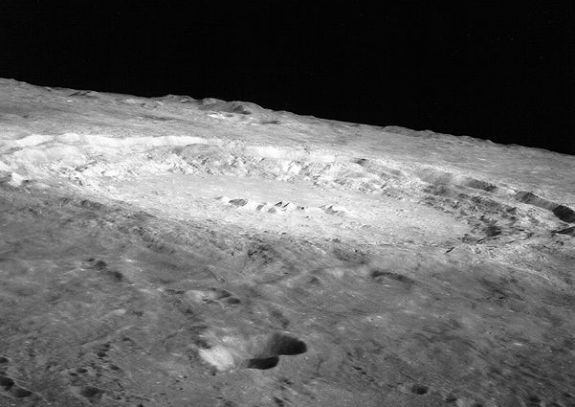 The crater is estimated to have formed about 800 million years ago during the Copernican period of lunar history, which was named after the crater. Copernicus is visible using binoculars, and is located slightly northwest of the center of the nearside, in eastern Oceanus Procellarum. The crater has a diameter of 93 kilometers and a maximum depth of 3.8 kilometers. Copernicus also has a dozen satellite craters ranging between 3 and 7 kilometers in diameter. By convention they share the name of the main crater with an added letter from “A” to “R” (for example “Copernicus A” and “Copernicus P”). The Apollo 12 mission landed north of Copernicus on mare basalts of Oceanus Procellarum and the crater itself was a possible landing site for the Apollo 20 mission, which sadly was canceled. 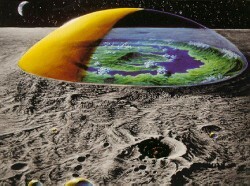 Copernicus crater is also a popular site for a lunar colony in numerous science-fiction works. This photo was taken by the Apollo 12 mission in 1969.